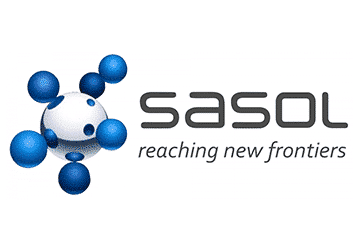 Sasol Ltd. is a world-wide petrochemicals and energy company engaged in the development and distribution of chemicals, liquid fuels and low-carbon electricity. It is listed on the New York and Johannesburg Stock Exchanges. David Constable serves as President and CEO. Sasol was founded in 1950 in South Africa where it maintains its headquarters today. Approximately 33,400 individuals are employed by Sasol throughout its network of specialized divisions located in 37 countries. For more than six decades, Sasol has been at the forefront of developing and commercializing leading-edge technologies to produce high-quality energy and chemical products. The Sasol corporate structure is one of three general “clusters,” under which multiple divisions operate. The three clusters are: Chemical, International Energy and Other. The divisions housed within these clusters are responsible for the development, production and distribution of Sasol’s fuel and chemical products. Sasol’s beginnings are in South Africa’s coal mines. In the 1920’s scientists began to explore the possibility of turning South Africa’s vast coal supply into liquid fuel. Research pursued the question and in the 1930’s Etienne Rousseau wrote a thesis entitled, “The Sulfur Content of Coals and Oil Shales,” and became the first managing director of Sasol. Sasol was incorporated in 1950 by the name of South African Coal, Oil and Gas Corporation, beginning its first synfuels production in 1954. Sasol’s corporate principals are: ensure the safety of its employees; create an environment that nurtures creativity, sense of contribution and that respects diversity; protect its reputation for honesty, dependability and ethical standards; be accountable to employees, stakeholders and customers; and deliver the best product and service. Sustainability was made a core element of the corporate-wide strategic plan in 2000, following which Sasol has infused elements of sustainable practices into every segment of the business. Included are efforts to minimize the Sasol footprint on the environments where plants are located. Sasol’s environmental policies exceed the requirements of countries where it operates, particularly meeting the most stringent standards of ambient air quality, reducing greenhouse gas emissions, and emphasizing development and manufacture of clean fuels for the world-wide community. Sasol Water Sense is a corporate-wide project to address the looming concerns of water shortage throughout South Africa. The focus is on reducing water usage now, to the greatest extent possible, to address water security risks across the globe where Sasol operates and increase public awareness of the scarcity of water throughout the world. Sasol produces fuel and chemical components and by-products. This includes: liquid petroleum gas, naphtha, diesel and petrol gasoline, polymers, ammonia, illuminating paraffin, Sulphur, comonomers, bitumen among others. Products are utilized across the spectrum of commercial, business and private life: perfumes, sunscreens, household and industrial paints, inks for printers, plastic bottles, mobile phone components, medical lasers, automobile products, coatings for microchips, and compact discs. Sasol is constructing a large-scale petrochemical plant near an existing facility in southwestern Louisiana. The $8.9B project will almost triple Sasol’s US chemical production capacity and includes six chemical manufacturing plants and a new ethane cracker that will enable annual production of 1.5M tons of ethylene. The new plant is expected to be operational in 2018.